You are here: Home / 컨텐츠 / Focus on / OLEDWorks, released LumiCurve Wave, a flexible OLED lighting. 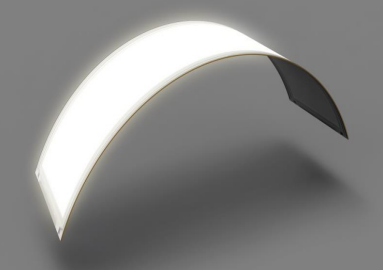 OLEDWorks, released LumiCurve Wave, a flexible OLED lighting. 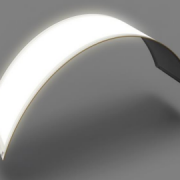 OLEDWorks recently announced the release of ‘Wave’, the first commercially available OLED (organic light-emitting diode) lighting platform on flexible glass. As part of the new LumiCurve product family, the Wave is processed on 0.1mm thin Corning’s ‘Willow Glass’. OLEDWorks says that the Wave panels are extremely thin and light and deliver the superb light quality and excellent color rendering that is uniquely achievable with OLED. The Wave is available in a warm white (3000K) model and a neutral white (4000 K) model. Warm white offers up to 300 lumens of brightness. Its efficacy is up to 62 lm/W (at 100 lumens), the temperature is 3000 K, and the CRI is 90. Neutral white has a maximum brightness of 250 lumens, efficacy of 47 lm/W (at 100 lumens), color temperature of 4000 K and CRI of 90. Both products offer a lifetime of up to 50,000 hours with a minimum bending radius of 10cm. OLED, which is actively being adopted by the display of current mobile devices and TVs, is also being applied to a wide variety of applications including indoor lighting, automotive lighting, and display lighting in the lighting market due to its unique surface emitting characteristics. In addition to OLEDWorks, which is launching new products, LG Display, which can mass produce OLED panels for lighting, is also expected to showcase various OLED lightings at CES 2019. Industries are focusing on whether OLED lighting market will be expanded in earnest. http://en.olednet.com/wp-content/uploads/2018/12/poiqehf.png 270 383 olednet /wp-content/uploads/2015/09/logo_oled.png olednet2018-11-29 16:26:092018-12-04 16:26:31OLEDWorks, released LumiCurve Wave, a flexible OLED lighting.